When I signed up for this class (or rather, gained permission to join it), I knew I would enjoy myself and add on to my knowledge of web design. The book we used for this course was very helpful in my learning and I plan on keeping it so I can reference it in the future. With so many neat tutorials, it would be hard not to learn something. The main thing that sticks out in my mind that I learned was how to use <div> tags. These tags are so useful for organizing sections of a webpage. I'm sure there are a lot more uses for <div> tags than what I used myself, and I can't wait to learn what they are and how to put them to use. Another thing I learned during this course that I believe will be useful to me is how to use Weebly! I had never heard of Weebly before, but I'm glad that I did. I may use Weebly in the future, either as a tool for practice or in order to publish a real website. Taking this class renewed my love of web design and reminded me just how much I would like to make it a career for myself. Hopefully one day I will be putting up websites of my own and helping others with businesses or projects that they need a webpage for. As I read through this chapter, there isn't much that I don't understand (which is a good feeling). Most of the information is review. I did mark page 411 with Figure 12-2 involving the <div> tags and how to use them. These <div> tags seem to be very important. On the top of page 412, the paragraph opens by stating, "Web page layout with CSS is more of an art than a science; there's no one formula to follow for marking up your content." I like this sentence because I am definitely more of an artist than a scientist. The creativity is mostly what draws me to web design. The next few pages give a few steps on how to get started with a web page, which I also consider to be more review. I did not find Chapter 12 to be confusing or difficult to understand. This chapter is about building float-based layouts, which might come in handy as I am building my web pages for this class. I have already attempted to tackle the figure properties from Chapter 8. I like the look of web pages with floating properties and multiple columns. It gives the viewer more to look at in one place rather than having to scroll down to find the content they are looking for. I might use the information in Chapter 13 to give my web pages a floating navigation. Pages 420 and 421 have figures that explain the floating tags and give nice examples of how to use them to lay out a page. I especially like figure 13-2. Something that puzzled me was the part about "floats within floats" on page 423. I might have to try the technique out in order to understand it better. Figure 13-5 on page 424 looks like something I might like to try with my web page as well. The page looks very neat and clean and I'd like to aim for a similar look with my pages. I would like to know how the look of the images in figure 13-8 on page 429 is achieved. I would definitely like to use some of the techniques in Chapter 13 while creating my web pages. Getting started with custom HTML in Weebly was not as easy as I thought it would be, but I finally made some changes to my pages with the help of the textbook. Before the changes, my background was plain white and the page seemed to stretch too far over the screen. After the changes, my pages now have a border that brings the page in a bit to make it appear more compact and readable to the eye. Since the design that I selected initially allows for the option of text wrapping around a picture, I don't need to add that feature via HTML coding, which is nice. I like this look on a webpage and I'm glad I selected a theme that allows me to choose that option. I took a lot of time changing my Weebly pages today and I am very happy with the outcome. Most of it was adding pictures and cutting back on unnecessary text, but I think that the site looks much nicer now. For my project I want to include basics such as a navigation with links to different pages, a banner at the top of the home page and unique pictures for each page of the website that correlates with the information on the page. I would like to choose background images and colors that are pleasing to the eye and go nicely together, but nothing too outrageous that might distract from the information on the pages. Along with these features, I want to choose a good font set and try to include some text modifications such as italics and bold. A goal that might not be possible for my project is some kind of movement on the page; though if I have time to attempt it, it might be an interesting feature to include somewhere within my site. I have incorporated several different elements into my Weebly page, including photos, links, and unordered lists. My favorite page is the Favorite Recipes page because of the 2-columned list of sweet and savory recipes. 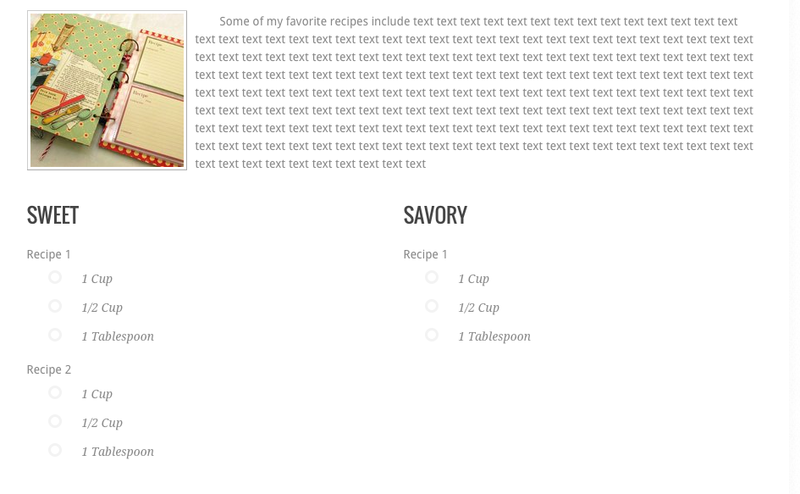 I like this element because it splits the two types of foods into clear groups with headings for each recipe. The theme I've chosen allows me to choose different colors for my headings in order to make them stand out more as well. I think the preset color (an almost-black) works well because it is not too bold, but the text stands out enough that you can tell it is a heading. I would recommend using this feature to someone creating a page about baking (or other topics) because it clearly separates the subjects and orders them neatly, as opposed to cramming all the information into paragraph form, so that viewers have an easy time finding what they are looking for. 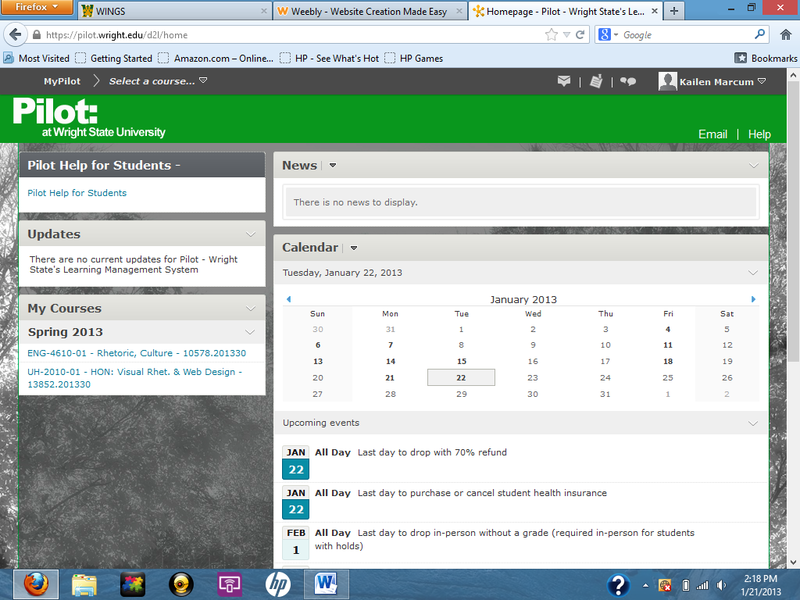 The new design layout for Wright State University's Pilot works well, at least from a student's point of view. If you are used to the old version of Pilot there are minor adjustments that may take some getting used to, however once you get past those, the design is easy to follow. The page is broken into neat, organized sections with clear headers and an easy-to-read font choice. Each section has links that take you to different pages within Pilot. Students' courses are clearly labeled, a calendar is placed int he center of the page along with upcoming events and news. At the top of the page there is a drop down menu where students can select one of their courses and go to a separate page designed especially for that course. 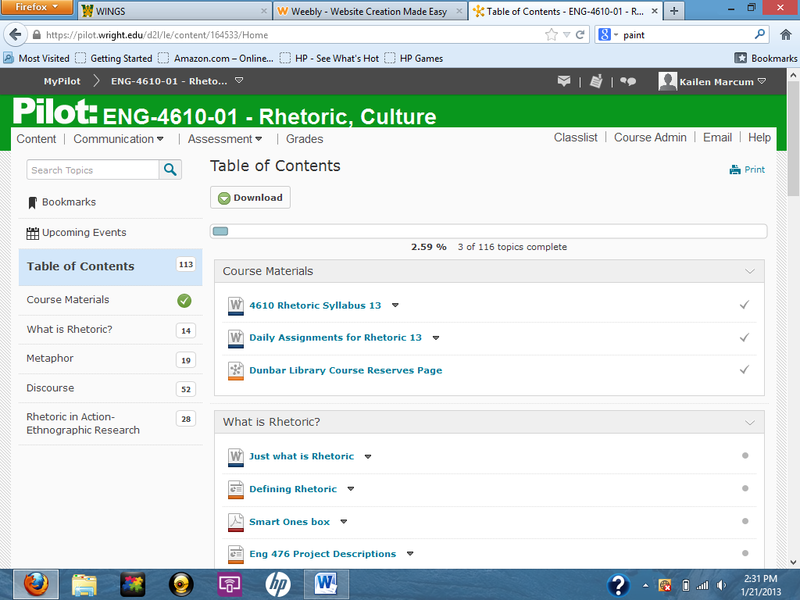 Once a course is selected, a new page appears with a new layout. Here, instructors can upload material for students. This layout makes it simple for students as well as instructors to understand. The layout includes a sidebar for easy navigation as well as links in the center of the page that lead to course materials. My name is Kailen and this is my blog.